I don’t know about you, but I’ve been as motivated as ever to improve my health and fitness game ever since Lauren deemed this month Get In Shape June. One thing that’s important to remember as you adjust your routine is that eating right is just as important as those trips to the gym. That’s right, working out is only half of the equation, ladies! For some, that might look like eating out less and cooking healthy meals at home more often. 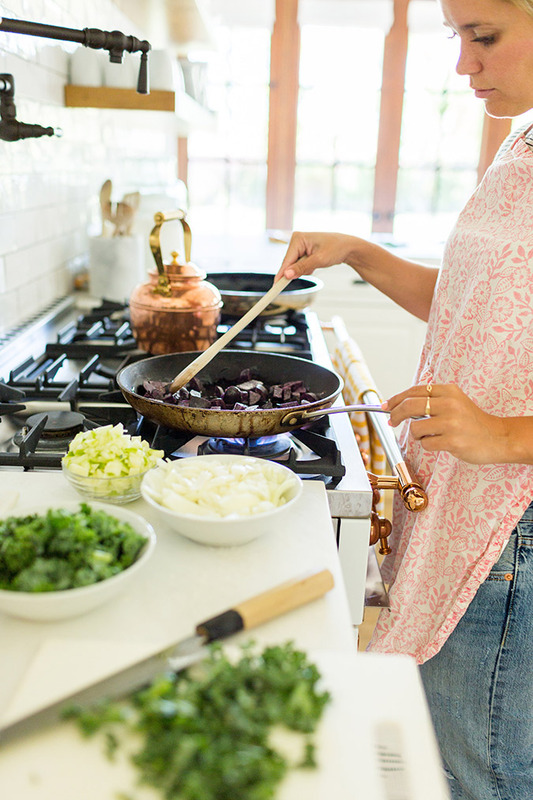 Throwing yourself into the kitchen won’t necessarily make you a healthier chef, however. So, to help you out on your health journey, I thought it would be beneficial to start with the basics…consider this a class in Healthy Cooking Oils 101. After all, you’ll be using cooking oil more often than you think. Olive oil is one of the more popular oils in the kitchen and on the dinner table. It can be used to sauté or roast veggies and proteins, but only at low temperatures due to its 375-degree smoke point. Olive oil has anti-inflammatory properties and is a heart healthy fat with antioxidants. The next time you pick up this oil be sure to choose extra virgin for dressings and low-heat cooking or virgin for pan-frying, roasting, or baking. Expert Tip: The smoke point of your various oils is the temperature at which the oil stops simmering and starts to burn. We all know how delicious and nutritious avocados can be in the beauty and health world. We recommending trying avocado oil in your kitchen because it’s loaded with vitamin E, can strengthen your immune system, and is high in monounsaturated fat (better known as the good fat!). Avocado is amazing in dressings or marinades and it has a 520-degree smoke point, so it can be used to sear protein safely. If you’re like me, you’ve never heard of ghee before stumbling across this informative post. Ghee is made when milk solids have been removed (casein and lactose), making it easier for those with dairy intolerance to digest. Believe it or not, high-quality grass fed butters like ghee can be good for you in moderation. Ghee is a great source of omega-3 fatty acids and vitamin A, a natural skin clarifier. It’s also rich in vitamin D, which helps protect against harmful UV rays. Due to it’s high smoke point, use ghee to sauté eggs or other animal protein. Admit it ladies, we are no stranger to the wonders of coconut oil. Use it in your hair, on your skin, and in your food. When ingested, coconut oil is used for energy instead of being converted into fat. Coconut oil is highly sustainable and great for sautéing or roasting veggies, just know that you most likely taste that amazing coconut flavor when you cook with it. Try using refined coconut oil—it has less of a coconut flavor and a higher smoke point. MCT, or medium chain triglycerides, are easy to digest fatty acids most often found in coconut oil. They are metabolized in the liver, actually making it so that your brain calms hunger hormones and tells the body that it’s time to burn fat for energy. MCT oil is a clear oil with a light taste that can be added to just about anything—smoothies, coffee, and even baked goods. Expert Tip: Take a tablespoon of MCT oil before you go out drinking with you girlfriends. MCT helps protect your liver from the oxidation produced by alcohol! Surprisingly I had never heard of algae oil until Kelly brought it to my attention specifically for this post. Algae oil is anti-inflammatory and is the highest source of monounsaturated fat. One tablespoon alone has as much monounsaturated fat as an avocado! It has a very light flavor and is best used for high heat cooking like stir fry with a smoke point of 485-degrees. Expert Tip: Swap out your vegetable oil for algae oil because they are the most similar. I don’t know about you, but I need to check a few more of these cooking oils off of my shopping list. Another huge thank you to Kelly for breaking down the important nutritional facts for these healthy oils! Are you familiar with any of these healthy cooking oils? Let me know which ones you use in your own kitchen in the comments below!